Digital success or digital disaster? An effective governance framework is essential for a well-managed intranet. It can be the deciding factor between a good user experience, greatly valued, and a poor user experience with little benefit. Every intranet is different depending on the size, type, and culture of the organisation it supports. However, there are some key governance principles that are common to their success. Recently I spoke at Intranatverk about this based on my book ‘Digital success or digital disaster?‘ which is a practical, experience-based approach to growing and managing a successful intranet. My slides ‘7 principles of good intranet governance’ are avilable for you to share. Think about how you build a house with the foundations, walls, floors, windows, doors and finally the roof. It would not make sense for you to have windows, doors, and a roof only. The same applies to your governance framework. These principles for good governance are not like a menu that you choose which items to have and leave others alone. You need to follow all of these to build a strong foundation to improve your intranet and implement your strategy. Read the introductory chapter of my new governance book to find out more. A license to share the ebook within your whole organisation is also available. When an intranet loses its usefulness over time, and people become disengaged and end up working around it rather than through it, I often find that the strategy and governance have been neglected. Even a strong and appropriate strategy will founder if the governance isn’t in place to execute it. I see governance as the foundation of a great intranet, and by ‘great’ I mean an intranet that is useful, useable, and supports the organisation’s goals and people’s needs. I often blog about intranet governance, but my brand new book offers a lot more than I could ever drip-feed via short posts. Writing a book has helped crystallise my thinking around governance, and delve deep into my past experience as an intranet manager, and as a consultant. 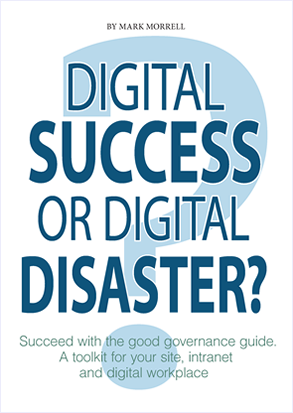 Take a look at my book now – it’s called ‘Digital success or digital disaster?’ and I mean for it to be relevant to intranets, collaboration, digital workplace and mobile workspace governance, while focussing on intranets. I’m so pleased to have it published through Intranätverk, it’s been great to work with Kristian Norling and his team. Seeing the final book on my tablet has made the months of writing all worth the effort. I’m thrilled to be able to offer you my experience, guidance, and tips and hope you’ll consider my book a toolkit to better governance and a better intranet. Please take a look at what the book offers you and your organisation – this is a ‘business book’ that should help organisations of every size, but I also hope it’s of interest to individual practitioners and ‘lone intranet managers’. I think this book can support you. * Digital success or digital disaster? – Book available now. * Follow me on Twitter – let me know what you think! How much is your digital workplace (and manager) worth? Do you know how much your digital workplace or intranet is worth to your organisation? How would start to answer the question? With the global economic climate unlikely to improve greatly, organisations will want to know the full benefits to justify before investing in your plans. In 2015, intranets are now at a jumping off point to become digital workplaces. People are increasingly using different methods to connect whenever they need to. When they connect it is to find information, use apps, share some news or ask for help with a work problem. In my last three posts I have covered how this is a wonderful opportunity for you to make your digital workplace a great experience, how you need to find everything to avoid it becoming a barren digital desert, to encourage more frequent use and improve people’s productivity. Have a strategy, governance framework, and information architecture that shows how you support your organisation. Demonstrate the full benefits of your plans. Think about the top priorities and goals your organisation has and align with them. Find the right methods that can assess the different benefits you identify as possible to achieve. This can be using surveys, polls, or more expert analysis. Consider the different ways you can show these benefits to convince your stakeholders. Make sure you talk their language to help them understand your plans. If you can complete all of these steps, you will have the best chances to gain the resources you need to implement your plans to transform your intranet into a digital workplace. It may also help show the value you provide as well. More on that in a later post! There are a lot of comments, opinion, discussions about the Digital Workplace but very few pieces of hard evidence that demonstrate what it means to you and your organisation. There is even less evidence that is free AND reliable that you can find too! But there is one way to have this for free by completing the Digital Workplace Survey. The Digital Workplace Survey is in it’s 8th year and provides insight into short and long term trends in the digital workplace. This is useful, not just for staying in touch with trends and planning minor enhancements in your own workplace, but also in strategising the future roadmap and major updates. It’s a great tool to share with senior management as it shows what other organisations are doing in the space via survey results, expert commentary and case studies. Participating organisations receive a free copy of the report and a customized Digital Workplace Scorecard which can be used to compare against similar organisations. There are only 10 days to go before it closes on 21 November so don’t delay participating! Who has the best intranet team? What is the purpose of your intranet team? How many people should you have in your intranet team? What should their roles be? How much money should your team have to improve your intranet? What is the right level of support from your senior managers? All of these questions I used to ask when I was the BT Intranet manager and since I left BT I have found clients who also ask me the same type of questions about their intranet team. Intranet teams mean different things depending on who is asked. How do you define an intranet team? It is the importance your organisation gives to your intranet and the resources it gives that normally decide your chances of succeeding. Luckily we have Uju is studying for a MSc in Information System Management & Innovation at Warwick Business School to help find the answers. She is working with Professor John Baptista and in partnership with ClearBox Consulting. Uju is researching intranet teams and how they are organised in various organisations within various industries. Factors to be considered include team structure, budget, geographical distribution, organisation size, industry, intranet usage etc. She is researching these topics using a survey and in-depth interviews. She will compare the results with relevant literature and best practice. Can you please find a few minutes to help by completing Uju’s survey? She will share the results with everyone who complete the survey at end of the research period. Is your governance good enough for SharePoint? I have written many blog posts on SharePoint based on my first-hand experience from developing strategies through to the full implementation of features such as TeamSites, MyProfile, etc. One of the most common requests I get from clients is “How is the best way to manage their intranet while using SharePoint?” This question is asked because SharePoint is a ‘big beast’ and needs a more rigorous and broad governance framework that is good enough for the challenge. SharePoint. The key is to understand what you need to use SharePoint for most of all. My first-hand experience at BT and from working with clients is that well planned and managed governance is good enough to gain the benefits from using SharePoint. It is how you approach this which is the critical success factor! You can out more information on how to build good SharePoint governance to help you. I have recently been reading Jane McConnell’s report ‘The Digital Workplace in the Connected Organization‘. You will have to go a long way and use a lot of effort to find another research report that will be as interesting, insightful and better value for money. If you haven’t bought a copy then please consider seriously doing so. The main innovation is the Digital Workplace Scorecard, which is based on the nine dimensions of the digital workplace model described in this report. The Scorecard works from self-assessment: scores are calculated based on several hundred data points from the responses to the online survey questions. All participants receive (privately) their own scorecard and can compare themselves to others in their industry by looking at the industry-specific scorecards or to the Early Adopters. All industry scorecards are published in the report. This year’s report represents a major step forward in understanding how the digital workplace impacts and is impacted by organizational processes, structures, leadership, culture and mindset. The survey covered these points in addition to the traditional questions about people capabilities, mobile services, finding expertise, sharing knowledge and so on. “The Digital Workplace in the Connected Organization” contains 23 “In Practice” cases that are developed in more detail than in previous years. The organizations selected for these cases stood out during the data analysis process, either because of high scores or because their comments and examples are relevant to challenges many organizations are facing today. Jane identifies this as a critical factor defined as ‘the values, expectations and ways of thinking that determine how people and organizations act’. My experience with intranets successfully transforming into digital workplaces requires senior managers to lead and encourage employees to change their way of working. Even more important is for senior managers to demonstrate by example how they are using it to help themselves for employees to follow. Many organisations have just started to adopt digital workplace ways of working. Many of my clients are in this position. Factors like access to real-time information, finding out information from people you don’t know and resilience when bad weather or other problems can affect service. Adopting the digital workplace can help to remove these major business issues with benefits of improved customer service and productivity savings. As Jane says in her report ‘People are increasingly deciding how they want to work and which tools suit them best regardless of corporate policies.’ with organisations recognising this as becoming the new reality with many employees saying they are ‘discouraged but accepted’ when using personal devices for their work. To me that feels like a major shift from a year ago and one of my 2014 predictions. Overall this research can be referred to many times as you continue your jouney to a fully integrated digital workplace for your organisation.